Anyone remembers and still eats Chan pei mui 陳皮梅? Chan pei mui is a traditional Chinese candy. I love it since I was a kid. 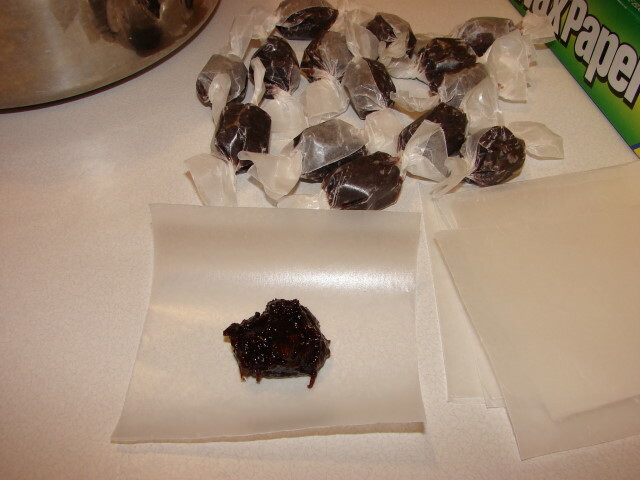 It is a fruit candy, looks brown/black soft and chewy with a strong citrus peel flavour. From the name chan pei mui 陳皮梅, you can guess the ingredients include chan pei or mandarin peel and the other is plum or in Chinese 梅 ('mui' in Cantonese or 'mei' in Mandarin). I have not had chan pei mui for years. Lately I craved for some, reckon I could make some but have no recipe to follow. I do know the usual ingredients include plum, mandarin peel, ginger, liquorice and sugar. Based on this I gathered a few ingredients and made my own concoction. The result was excellent, much like what I remembered. Love it so moreish. Here is to share with you the recipe if you like to try. This recipe will make about 55- 60. * liquorice root powder is available from many Chinese grocery stores, looks greyish yellow like ground white pepper. Cut prune into small pieces, soak with 1 cup of hot/boiling water and leave overnight to soften. Soak dried peel till soften. Together with fresh peel boil with about 4 cups of water for about 10 - 12 minutes. Discard the water and drain. Boiling removes bitterness of the peel. Finely chop the peel. Plum removed stone and cut into small pieces. 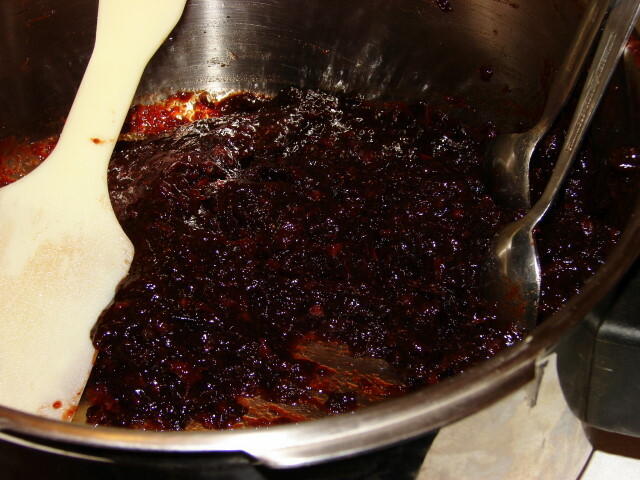 Boil/simmer prunes, peel, plum and ginger with 1 cup of water till the fruit and peel become very soft. I used a pressure cooker took about half an hour. Without pressure cooker this will take longer and may need more water if the mixture starts to stick to the pan before the mixture getting soft. When mixture is softened, add remaining ingredients. Stir and cook on medium high heat to reduce the mixture. During the initial stage of rapid boiling, the mixture will splatter keep stirring will reduce splattering. After a while when the mixture will thicken some more splattering will reduce and eventually stop. Stirring less when mixture beginning to thicken, but make sure to scrape the pan bottom to prevent sticking and burning. Boil the mixture till very thick. The texture to look for is very thick like chutney, will drop off a spoon in a lump not so quickly. Overall it took me about 45 minutes. Leave to cool completely. The mixture will become even thicker after cooling like a christmas pudding texture. Cut some wax paper/ parchment paper/cellophane paper into 10cm squares. If you make this as gift you can wrap with wax paper inside and pretty tissue paper outside. Spoon a lump of the mixture onto paper. 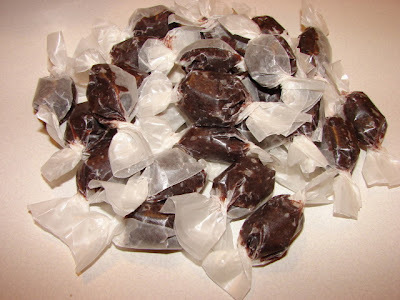 Roll the paper then twist the ends to form a candy. This freshly made chan pei mui is quite sticky and will stick to the wrapping paper but if you leave them on the table to dry naturally for few days they are easier to unwrap. Also try to resist eating them for a week or so will improve the flavour. They will make nice gift for anyone's sweet tooth and for Chinese New Year.